... a script written by Isobel Lennart, the music of Jules Styne, the lyrics by Bob Merrill, a stagedirector called Garson Kanin and a producer, Ray Stark. But until now, there was no performing star. That star rose after the opening of a new musical - a kind of Ugly Duckling story. This new musical opened on March 26 1964, in the Winter Garden Theatre on Broadway - the same theatre where, 27 years before, a big star made her last performance. That big star of 27 years before is the role model for the rising star in this new musical, based upon the life of Ugly Duckling Miss Fanny Brice. Fanny Brice rose from a homely, gawly young girl in Manhattan's Lower East Side, to one of Florenz Ziegfeld's funniest and most popular stars. Funny Girl is her story, in a new story, with a new Funny Girl - Barbra Streisand. 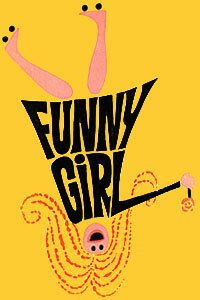 Funny Girl opened on March 26 1964 in the Winter Garden Theatre in New York and ran as long as 1.348 performances. Coronet Man on Broadway - Barbra as Fanny in Funny Girl. Fanny as Funny Girl, 55 years earlier, when she stopped with the show Lovie Joe. Two new stars, om their way to the top on Broadway. Funny Girl was based on the life of Fanny, and traced her career from her girlhood on Lower Eastside of New York to her appearance in the Ziegfeld Follies. The opening scene, set backstage in the New Amsterdam Theatre, shows Fanny waiting in her dressingroom for her husband Nick Arnstein, who has just finished serving a prison term for embezzlement. She recalls the events that have led up to this moment. She broke into show business with Keeney's Music Hall and her talent soon gained her a featured number. One evening, matinee idol Arnstein showed up backstage. But he was not an actor, rather, an elegant gentleman present only to pay off a gambling debt to Keeney. Awkward, funny Fanny had never met such a beautiful man. Florenz Ziegfeld broke the trance with an offer to appear in his Follies. She was a smash, Nick was there and at the party at Fanny's home afterward. They found love and need in each other, but Nick was due in Kentucky on business. Several months later their paths crossed in Baltimore. Once hurt, she reluctantly joined Nick for a private dinner and was overwhelmed. She left the show to marry Nick. Eventually, Fanny returned to the new Follies and her star rose high. Nick tried to keep pace but his luck turned at both gambling and business deals. Fanny tried to secretly underwrite an important venture, but Nick found out and was more resolute than ever to make it on his own. To Nick, pride was more important than involvement in a phony bond deal. Now, as Fanny waits she knows her future is in the balance. Where does Nick stand? Can he forgive and overcome? He arrives and is reluctant. He knows himself too well. As he leaves her, Fanny picks up her life and prepares to go onstage. "I'm a bagel on a plateful of onion rolls," she explains. "Or" she wonders petulantly, "you think beautiful girls are going to stay in style forever?" The premiere of Funny Girl - the movie, at New York's Criterion Theatre on September 18 1968 was clearly a Streisand triumph. Indeed, she was going to be a big world star in a three-hour one-woman-show and it's Barbra Streisand all the way. The real talent of Fanny Brice can best been seen in the movie Be Yourself (1928) which is available on video.